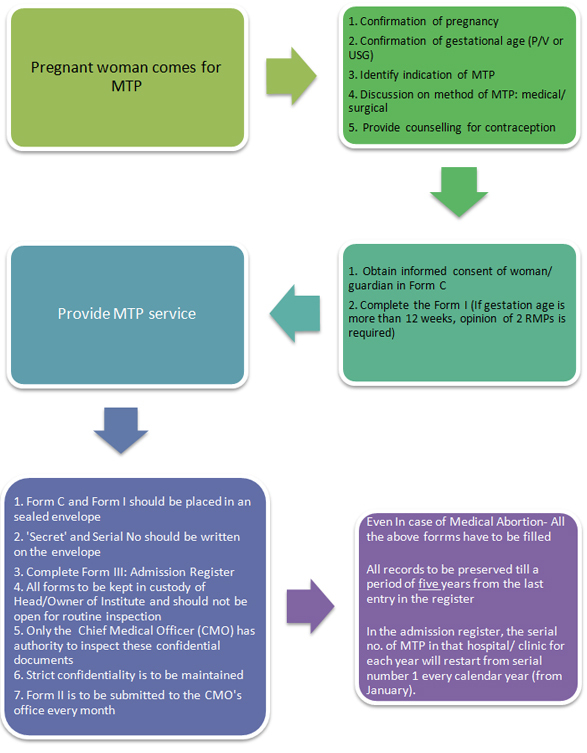 Form 1 is used for recording the opinion/ opinions of registered medical practitioner / practitioners regarding indication under which MTP is to be carried out. c. Every registered medical practitioner/ practitioner who terminates any pregnancy shall, within three hours from the termination of pregnancy certify such termination in Form I.
a. If a woman is of the age 18 years or more then only her consent is required for the termination of her pregnancy. b. If a woman has not attained the age of 18 years, or is a mentally ill person, then consent of her guardian is required for the termination of her pregnancy. The Completed Form 1 and Form C shall be placed in an envelope which shall be sealed. On every envelope pertaining to the termination of pregnancy, there shall be noted the serial number assigned to the pregnant woman in the Admission Register and the name of the registered medical practitioner by whom the pregnancy was terminated and such envelope shall be marked �Secret�. a. As per regulation 4(5), every head of the hospital or Owner of the approved place shall send to the Chief Medical Officer of the district, in Form II, a monthly statement of MTP cases. c. Admission Register shall be a secret document and the information contained therein as to the Name and other particulars of the pregnant woman shall not be disclosed to any person except under the authority of law. No entry shall be made in any case sheet, operation theatre register, follow-up card or any other document or register other than admission register indicating therein the name of the pregnant woman and reference to the pregnant woman shall be made therein by the serial no. assigned to the woman in the Admission Register.